This weekend I setup my own SVN source control server running inside of a CentOS 5.4 virtual machine. Once my new SVN server was setup and ready to roll, I tried checking out one of the repositories. From the nearest command line, I started typing svn co http://192.168.1. … damn, what was the IP-address of my local SVN server again? I just picked an IP-address about 15 minutes ago during my CentOS install, but already forgot it! Ok, time to setup a decent local DNS server for my home network. Since 2006, I’ve been limping along manually editing my /etc/hosts files on multiple machines and memorizing the IP-addresses of critical devices on my network. Looking back, this was just plain silly. My network topology, shown in the diagram below, isn’t too complicated. 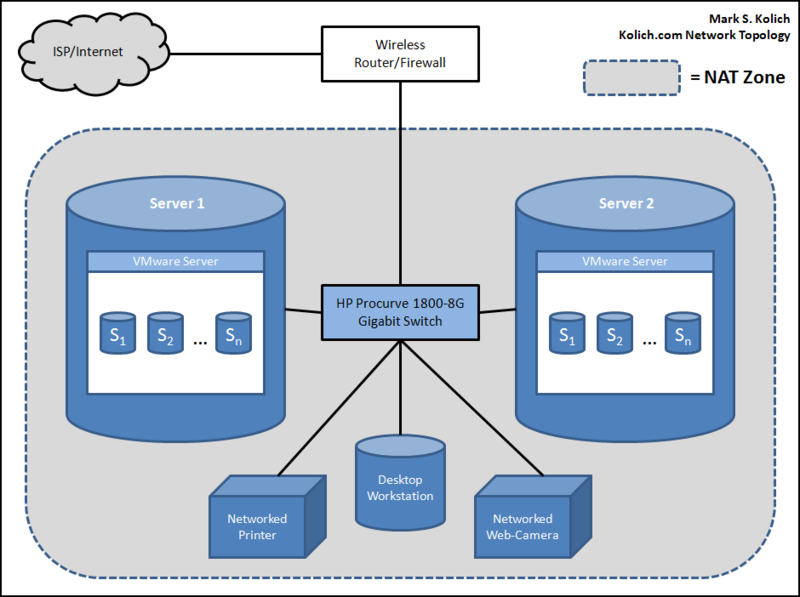 In fact, it’s probably quite standard for an average developer — I’ve got a typical wireless router and firewall appliance connected to an HP Procurve 1800-8G Gigabit switch which fans out the bandwidth from there. Generally speaking, most traffic on my home network is local so everything sits behind the HP Procurve Gigabit switch. I’m more concerned about the internal network speed between devices, instead of device to the outside world. And of course, all of my devices sit behind NAT, which the router handles for me. The DNS for my publicly visible domain names are hosted by my registrar, Network Solutions. I’m not planning on hosting my own DNS for these services anytime soon, so I just needed something to help me out around the house. In other words, I just need a local DNS server so I can resolve addresses internally on my network. I was getting really tired of typing ping 192.168.1.102 when I could have been typing ping somebox this whole time. In addition to resolving locally, if the DNS server receives a request to resolve a name it doesn’t know about, I want it to forward the request to my favorite DNS provider, OpenDNS. So if my DNS server receives a request for somebox, and somebox is a local device on my network, it should resolve to 192.168.1.whatever. However, if it receives a request to resolve google.com, or some other domain it knows nothing about, it should forward the request to OpenDNS and cache the response if necessary. I should also add that every device with a name on my local network, has a hostname that ends with kolich.local (this is my new DNS zone). This is so I can distinguish internal devices from servers, and services, running externally under kolich.com, koli.ch, or another domain. You should note that named on CentOS, and probably other newer Linux distros, runs inside of a chroot’ed environment which I have no interest in explaining here. If you want to read more about chroot, check out this decent overview of it on Wikipedia. For the sake of this blog post, you probably don’t have to care about how named runs under chroot. I have two zone files: kolich.local.ns and 1.168.192.in-addr.arpa.ns. The first zone file maps a list of hostnames to IP-addresses, and the second defines a reverse lookup zone that maps a list IP-addresses back to hostnames. Note that because named is running under a chroot’ed environment, it’s usually safest to place these zone files under /var/named/chroot/var/named (yes, that is the correct path) on a typical CentOS/RHEL/Fedora installation. In my /etc/named.conf file, notice I’ve given two forwarders in the options section. This declaration lets me tell named to forward any requests it cannot resolve to OpenDNS at 208.67.222.222 or 208.67.220.220. Note that my 1.168.192.in-addr.arpa.ns zone file is basically a reverse map of my kolich.local.ns file. Of course, depending on your local network settings, your IP addresses might be different. And no, the systems and devices on my network are not named after animals; the names shown here are just for the sake of this example. Perfect. Internal hosts resolve correctly, and my DNS server is forwarding all requests it can’t resolve to OpenDNS as desired! Finally, with a proper DNS server up and running, I can get back to my project.